If there’s one thing we know how to do in Austin, it’s celebrate. If there’s one thing we know how to celebrate, it’s the Holiday Season. What’s compiled herein is a step-by-step family friendly recipe for a traditional Austin Christmas with a twist. Because it wouldn’t be Austin if there wasn’t some sort of oddity. Perhaps one of the more eccentric and oddball of Austin traditions are the Loop 360 Christmas Trees. If you aren’t familiar with this practice, and decorating your personal tree just isn’t enough, tradition dictates that the trees along Loop 360 are fair game to adorn with ornaments, tinsel, and other Christmas trinkets. Keep in mind, since this isn’t recognized by the city, there isn’t an official website or department that handles this activity. Nevertheless, there are still some unwritten rules that apply. 1. Be sure to secure your decorations. They’ll be out in the elements all day and, as a safety measure, you don’t want them to fly away. 2. Clean up your decorations after the holiday season has ended. It’s because of this that Austin residents are allowed to keep this tradition alive. 3. Be creative, be loud, and be proud. Since the trees are on the side of the road, only the most grandiose will be often seen and admired by passersby. This is also a really great place and opportunity to take unique Holiday family photos. The most important thing to remember is that, once the season is over, these decorations should be cleaned up, otherwise this Austin ritual may be a thing of the past. Now that you’ve taken part in decorating a tree, you have the chance to see someone else’s handy work. 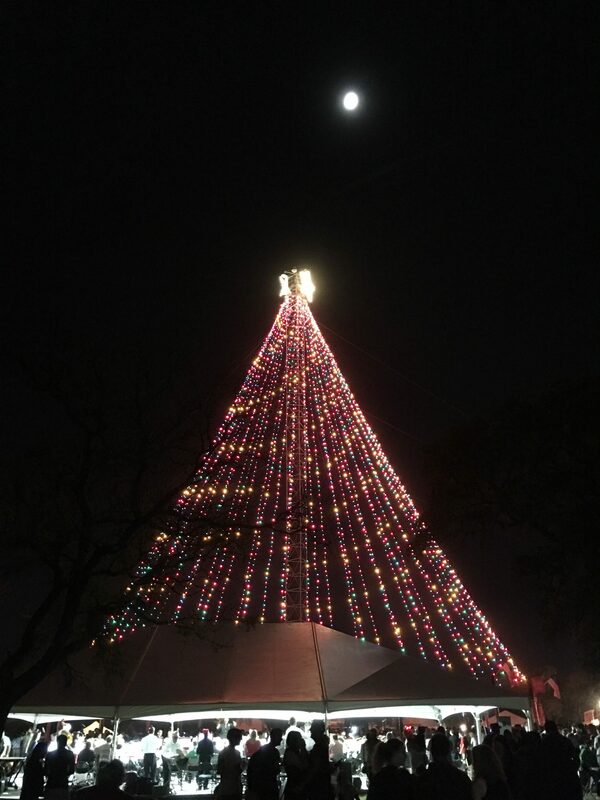 To kick off the holiday season, the Austin Parks and Recreation Department, along with the Mayor’s office and other officials, gather to host the lighting of the Zilker Holiday Tree. Standing at an imposing 155 feet in the air and boasting 3,309 lights, the Tree is topped with a 10 foot wide double star incorporating 150 bulbs. The skeleton of the tree is one of Austin’s 15 remaining historic moonlight towers, the only known surviving such light towers in the world. The tree is 120 feet in diameter and 380 feet in circumference, longer than a football field. As you can imagine, this event brings in many viewers, all vying for a position under the tree. It’s recommended that you arrive early to stake out a spot and beat the lines leading to any of the available food trucks. My suggestion is to park away from Zilker, on one of the surrounding streets or lots, and make the short trek in. The view in that area, and at that time of the day, is well-worth the walk. The lights from the Zilker Holiday Tree are so majestic and magnificent, it’s potentially possible to view these festivities, among many other Austin attractions throughout the year, from the comfort of a downtown highrise apartment. For more information on this, reach out to Tarek Morshed, your expert Austin realtor. With your tummy full of food truck delights and your eyes beguiled by dazzling lights, it’s time to engage in the timeless winter custom of ice skating. Every year the Plaza of the flagship downtown Whole Foods opens to the sharpened skates of ice enthusiasts. At $10 a person, which includes skate rentals, this is an affordable and easy way to curb your appetite for ice. 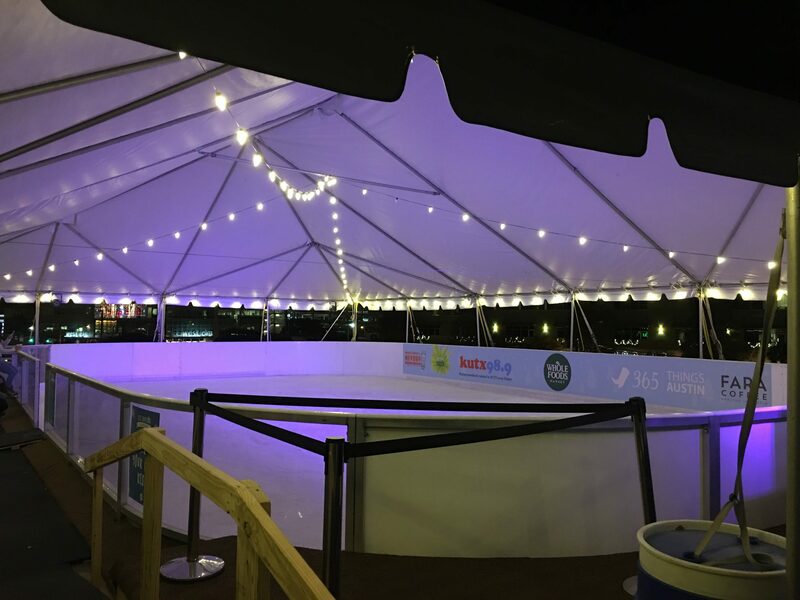 Situated under a canopy embellished with lights, the setting provides the perfect backdrop for a first date, a family outing, or a place to clear your mind and skate solo. If ice skating isn’t your thing, but you want to take the kids, you can post up at any number of nearby benches or tables and enjoy the experience. While Fridays, Saturdays, and Sundays will remain open to the general public, if you’re going on a weekday, they recommend you contact Guest Services (512-476-1206) to confirm if there will be a private party that night. Alternatively, if you’d like to reserve the Plaza for a private event, that is an option. The sun has gone down, there’s a chill in the air, and visions of sugar plums are dancing in your children’s dreams. It’s finally time to celebrate the day’s successful adventure with a nightcap. 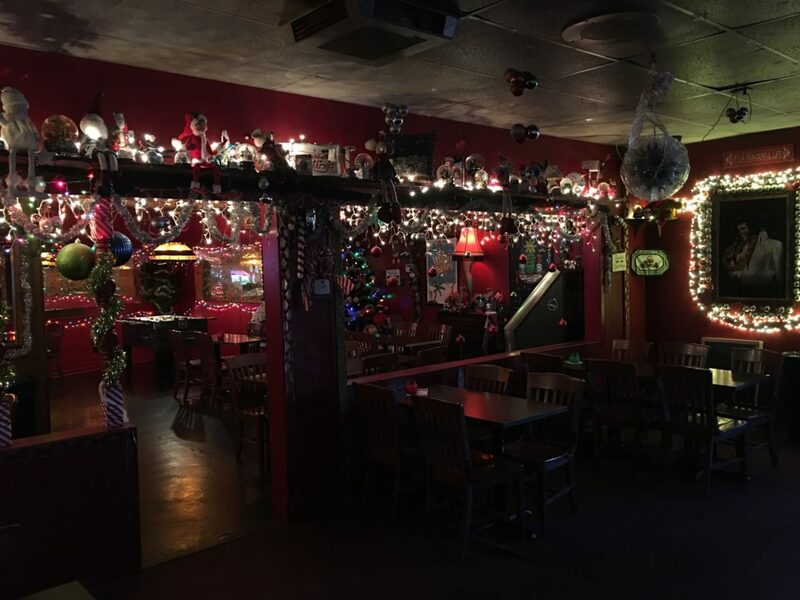 My recommendation is Lala’s Little Nugget, a year round Christmas themed bar straddling the border between the low-key Crestview Neighborhood and close-knit community of the Brentwood Neighborhood. Minus the inflated Santa and reindeer on the roof, Lala’s unassuming presence from the street makes it relatively easy to miss. However, on approach, you’re welcomed with a superbly spacious, newly constructed patio and plenty of strip mall parking. Making up the exterior of Lala’s are North Pole style red brick walls, snowflake decals, and even stockings hung with care. Once inside, the dazzling amount of lights, decor, and attention to detail are sure to conjure ruminations of your youth. With ornaments hung from seemingly every square inch of the ceiling, tinsel on the walls, and even a full Christmas Tree in the corner, it’s impossible to restrain your wide-eyed wonder. Don’t be embarrassed as the staff, who are as enchanting as the holiday in question, are used to the audible exclamations of sheer glee. The Christmas cheer isn’t only limited to the decorations or delightful staff at Lala’s Little Nugget. With eight rotating taps and a bevy of mixed drinks (from peppermint to vanilla to cider to eggnog) you’re sure to find something that satisfies all your seasonal cravings. Oh, did I also mention they’re attached to Stubb’s BBQ and allow you to bring your food in to eat at one of their many tables? What else could there possible be to say about Lala’s Little Nugget? So that’s it, you’ve satiated your holiday need to decorate, indulge, delight, and even ice skate. All within the span of a day and within the boundaries of our gorgeous city. If you’re bored of the norm and looking for something new, this may be a tradition your family adopts this Holiday Season and many more to come.